Maybe DA think that pic get mature content (please don't delete it! It's only sweet!). So just in case of, there is mature content. agree! There is just a cute pairing! So Hinata finally got over her shyness eh? BTW, that seal is only supposed to show up when Nartuo uses his Chakra, unless I'm mistaken. Oups... But He looks coolest with it, no? 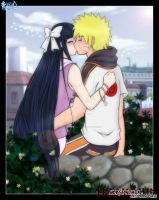 Hinata: Naruto Kun I'm ready more than ready i love you. Cute!Love ur comment( as usual!) Thanks! Thanks! I love this pairing! Thanks for your comment!